Created with family outdoor living in mind, the combination of traditional and modern structures of the Malibu Outdoor Patio Wood Rectangular Dining Table makes it perfect for your outdoor space in every season of the year. Made from 100% Eucalyptus - a very durable Hardwood, this table can stand up to all kinds of changes in the weather. The pores of the Eucalyptus is very dense; thereby it quickly repels water, and its natural oil combats and repels wood eating insects. Comes in the beautiful Natural Wood Finish, this will be a great addition to your outdoor patio! Extend your homes living space in your own backyard with this inviting patio dining set from the Park Terrace Collection. The PPT-602-T Dining Table offers a great place for family and friends to gather. The steel frames, black safety glass and UV resistant resin rattan are durable enough to withstand the elements so you can enjoy outdoor dining this spring, summer and beyond. Complete this dining set with the PPT-603-C four chair set, sold separately and available from Sonax. Malibu Outdoor Patio Wood Rectangular Dining Table with Curvy Legs Created with family outdoor living in mind, the combination of traditional and modern structures of the Malibu Outdoor Patio Wood Rectangular Dining Table makes it perfect for your outdoor space in every season of the year. 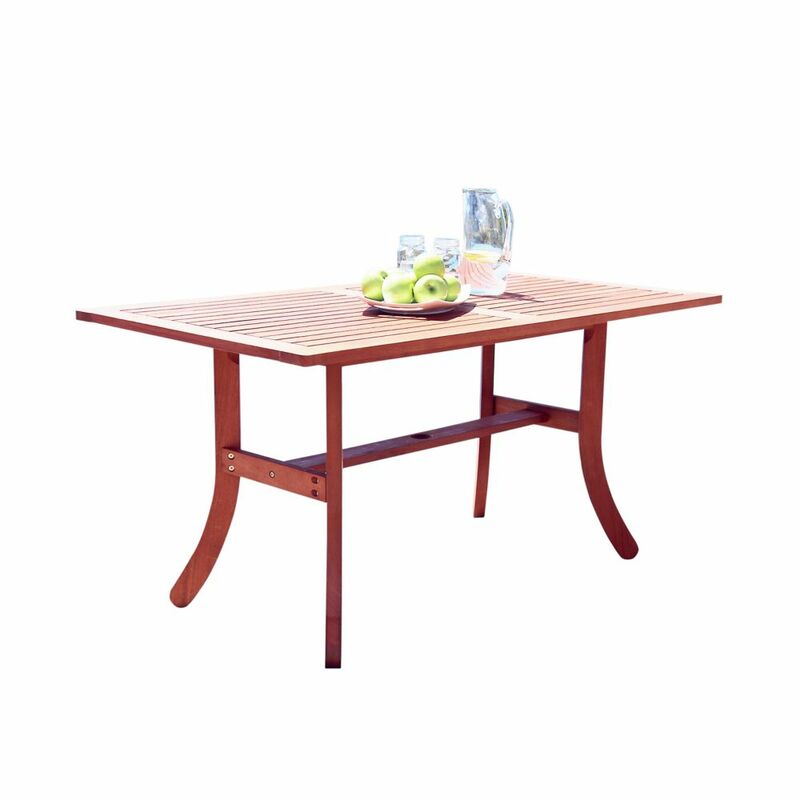 Made from 100% Eucalyptus - a very durable Hardwood, this table can stand up to all kinds of changes in the weather. The pores of the Eucalyptus is very dense; thereby it quickly repels water, and its natural oil combats and repels wood eating insects. Comes in the beautiful Natural Wood Finish, this will be a great addition to your outdoor patio!